Shaun Greenhalgh is widely known as an art forger. For seventeen years between 1989 and 2006, he produced and sold a wide variety of paintings, sculptures and pottery forgeries. These were sold to museums, at auction houses and to private buyers, making him, his parents and brother nearly £1 million. In November 2005, he was responsible for forging 3 Assyrian reliefs, which when inspected were spotted as obvious fakes. The reliefs, of soldiers and horses, were found to have inconsistent reins, as well as a spelling mistake in one of the inscriptions. The museum he tried to sell these Assyrian panels too contacted the Arts and Antiques Unit of Scotland Yard and 18 months later, Shaun and his family were arrested. He was jailed in 2007 for 4 years and 8 months. Now released and working as a binman, he recently published an autobiography which has some big claims that have shocked the art culture. 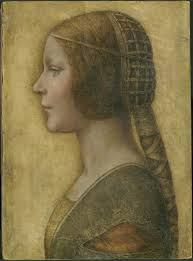 The most surprising of which, involves a painting of La Bella Principessa, a noblewoman in the court of Ludovico Sforza, Duke of Milan by Leonardo Da Vinci. Greenhalgh claims he drew the picture in 1978 when he worked at the Co-op. It is supposedly based on a girl called Sally who worked on the tills there. A lot of thought went into this forgery, if indeed that is what it is. He bought a land deed from 1587 that was written on the same vellum that Da Vinci would have used to ensure the canvas was the right date. He used the lid from a Victorian school desk his father brought him from Bolton Technical College, where he worked, for the back, and he used sap from an acacia tree to make the ink. Why? Because that’s what was used in that period. Greenhalgh was right-handed, so to replicate a left-handed drawing action, he claims to have turned the painting upside down. However, scientists in Paris have suggested that the chalk used in the painting is 250 years old. Jeanne Marching first brought this painting into the spotlight in 1998 when it was sold at Christie’s auctioneers. She claimed it had been in her late husband’s collection since 1955, which is six years before Greenhalgh was even born. Francois Borne, the expert involved in the sale, wasn’t convinced, and sold it for only £14,500. Peter Silverman has owned this painting since 2007, and he believes it’s a genuine Leonardo Da Vinci. So much so, that he refused an offer of £53 million for it. Whilst there are strong arguments for it to be both an original and a forgery, the views are split and it’s currently unclear which is true. What we do know is, that whatever the truth is, it’s sure to come out in the end.